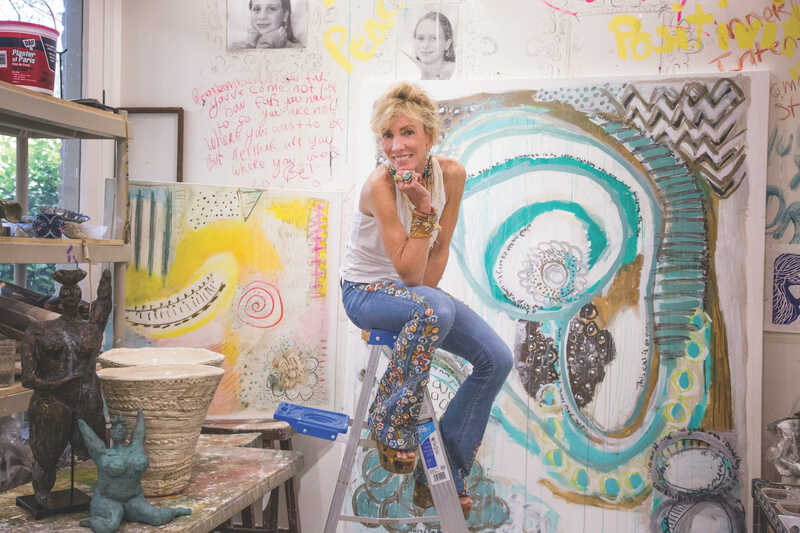 JULIE SILVER SURROUNDS herself with art. In a light-filled room, she overlooks manicured gardens accenting the architecture of Pio Lyons and contemporary sculptures by Arthur Silverman, Steve Martin and other noted Louisiana artists. Indoors, the collection of “high and low” or whatever strikes her as “art filled with soul,” is interspersed with her own sculptures and paintings from various stages in her life and artistic career. Her philosophy has always been “when I sold one, I bought one.” The result has been the accumulation of an impressive range of artwork. As intriguing as such a strategy may be, the collection also reveals her interest in the artist as model in contemporary art. The figurative painting by Blake Boyd is one of several images by painters and photographers whose works include Silvers as model. Others are more specific in keeping with contemporary portraits and include images of Silvers and her family or Silvers’ photographs of her daughter, Taylor. The integration of Silvers as collector, maker and model fascinates. Whereas sculptures and many functional vessels by Silvers do not rely on color, it is the neutrality of the white or black clay that emphasizes the form, textures and patterning characteristic of her style. Her paintings and her recent works in ceramics have many qualities in common, but the light, whimsical color palette she uses in a two-dimensional format adds a different flavor to organic shapes and repeating patterns brightly rendered. Silvers work is exhibited at Julie Silvers Art, 3714 Magazine Street, New Orleans. More information may be found at juliesilvers.com.